Dine by candlelight in the nighttime green oasis of The Grounds of Alexandria. The Potting Shed is the latest venture by Alexandria's food and coffee mecca The Grounds, and it must surely be the only Sydney restaurant where the entrance is adorned with a flaming wheelbarrow. As each table is nestled amongst planter boxes, hanging gardens and lush green foliage, selecting a spot for dining in the low-lit al fresco area conjures a sense of being part of a Disney princess's daydream. 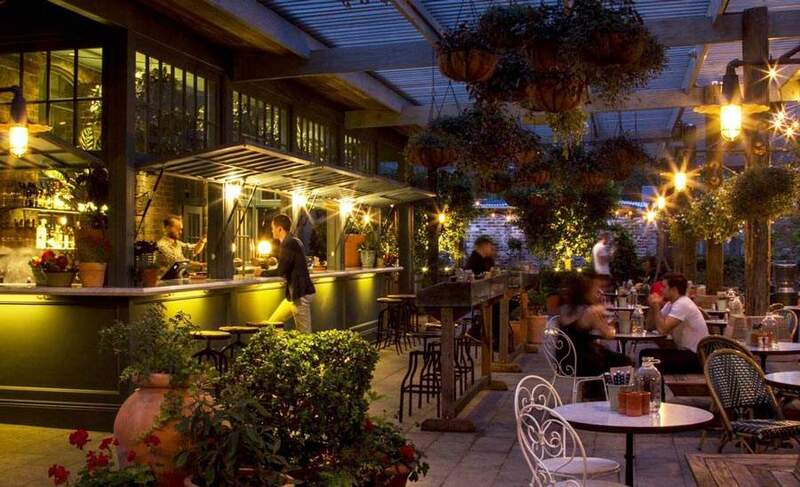 Hence, The Potting Shed is equally perfect for romantic dates or casual groups. While perusing the extensive menu, we recommend relaxing with a warm pear cider ($12) comprising vanilla bean, pear syrup and Hillbilly Cider, brewed locally in the Blue Mountains. This cosying refreshment is charmingly heated over a soft open flame at your table. Be sure to peek inside the tin teapot and retrieve the two soft pear cheeks infused with the aromatic spices. The first section of The Potting Shed menu, Share with friends, consists essentially of communal plates designed for leisurely grazing. The generous meals are therefore ideal for sharing as well as catering to those who enjoy sampling a little of everything. The crispy school prawns with sriracha mayo ($11) was a standout, as was the delectable cheese plate ($20 for two). This plate is handsomely laden with internationally sourced cheese, cured meats, fruit, marinated vegetables and also hosts an assortment of daily baked breads. If guidance is required, the cordial waitstaff can offer suggestions on the perfect pairing from their substantial wine list. The salads are hearty numbers; roasted baby beets with goat's cheese, radicchio and hazelnuts ($19) particularly impresses and would provide a fresh accompaniment to any of the meat-centric main courses. The mains menu features free-range locally produced meats, and with grand portions, consider sharing a selection amongst a group, unless you're starving. There's sticky glazed slow-cooked short ribs ($22) and crumbed veal cutlet with spiced plums ($24); however, it's difficult to bypass the charcoal Holmbrae half chicken ($28) — three hours of sous vide, then finished on the fire and served atop a bed of grains alongside an elegant salad of cucumber ribbons, pomegranate, fenugreek and walnuts. The charcoal chicken was so incredibly succulent it amazingly managed to possess the flavour of eight chickens packed into one god-like super chicken. On the lighter side, there's the Pansotti ($19), plump pasta parcels stuffed with sweet roasted carrots and goat's cheese, dressed with an earthy walnut sauce and a drizzling of marjoram burnt butter. This artfully balanced vegetarian dish is decidedly where the money is at. If you have any space left for dessert, don't pass up banana tarte tatin with coconut icecream and hazelnut praline ($12) or the mango and pineapple sundae with a scoop of salted caramel ice cream ($12). Otherwise, if you can't muster another course, there's a comprehensive cocktail menu, if you prefer your dessert to be of the liquid variety.